More than ever before, structured cabling systems are becoming increasingly complex and sophisticated, meeting greater demands and workloads. With emerging connectivity developments in hardware and software, structured cabling tolerances are becoming ever more stringent. A network’s physical infrastructure must incorporate security and integrity into its inherent design, as well as the ability to adapt to changes in technology. Airpath has specialist experience in designing, building and installing structured cabling solutions that meet every industry requirement. All engineers are fully trained in the complete range of competencies covering installation, termination, inspection and conformance testing. 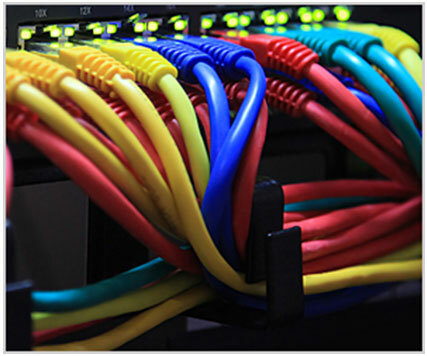 Our thorough knowledge of leading manufacturers structured cabling systems in copper, fibre optics, blown fibre and wireless LANs ensures that client’s requirements are carefully met. Airpath’s structured cabling solutions are designed to fit our customer’s present and future requirements, incorporating flexible and cost effective options. As a leading installer, Airpath are proven to provide established, reliable cabling solutions for all sizes of business premises. All copper solutions, such as Cat5e/Cat6 and the emerging Cat6A and Cat7, carry a manufacturer's product and performance warranty, and the product range is highly competitive in the cabling market. Airpath’s Fibre Optic Solutions include a wide and innovative range of products available for short and long haul circuits, utilising single and multi mode fibres. Airpath’s project design, management and implementation of our installations provides our clients with the reassurance of quality and service.